According to O.J. Simpson, all he wanted to do on the night of Sept. 13, 2007, was retrieve sports memorabilia that was rightfully his. But prosecutors believe Simpson and a group of six other men forcibly entered sports memorabilia collector Bruce Fromong's hotel room at Palace Station and robbed him at gunpoint on Sept. 13. The former NFL star and co-defendant, Clarence “C.J.” Stewart, faced a dozen robbery, weapons and kidnapping-related charges. On Oct. 3, 2008, both were found guilty on all counts and taken into custody. Sentencing will be Dec. 5, 2008. 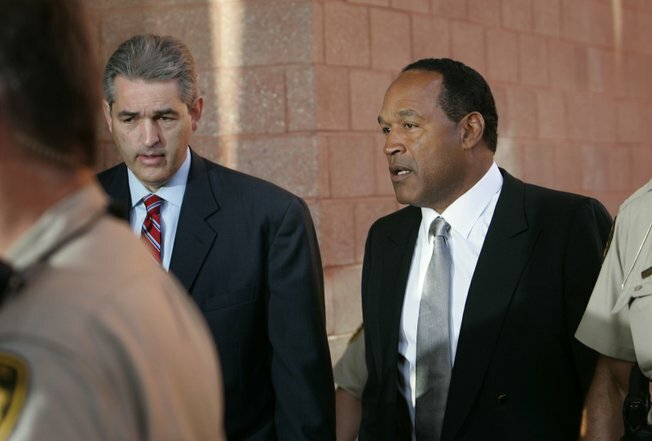 Find expanded coverage of the trial and sentencing here at lasvegassun.com/ojsimpson. O.J. Simpson is going to prison. A predominantly white, predominantly female jury has found the former NFL All Star guilty of all of the 12 robbery, kidnapping and weapons charges he faced following a run-in last year with a pair of memorabilia dealers. The defense has rested its case in the armed robbery/kidnapping trial of O.J. Simpson and his former golfing buddy, Clarence "C.J." Stewart. The following are quotes from O.J. Simpson's robbery/kidnapping trial in Las Vegas. The O.J. Simpson robbery/kidnapping trial entered its third week Monday as the state's last witness returned to the stand to complete his testimony. The second week of O.J. Simpson's robbery/kidnapping trial saw several of his alleged co-conspirators take the stand to testify against their former friend. The North Las Vegas man who last year brandished a loaded gun and shouted obscenities during the infamous hotel room raid involving O.J. Simpson testified against the former NFL star Friday afternoon. O.J. Simpson's defense lawyers today took advantage of state witness Metro Police detective Andy Caldwell's second appearance on the stand by scrutinizing what investigators working on Simpson's robbery/kidnapping case said while processing the scene. One of the men who was allegedly robbed at gunpoint by a raiding party led by O.J. Simpson last year at a Las Vegas hotel today told a jury that the audio recording of the encounter could have been doctored in Los Angeles before being handed over to police. Oh, what a difference a year can make. When Alfred Beardsley visited Las Vegas in September 2007 he booked a room at Binion's Horseshoe Hotel & Casino. When he recently returned a year later to testify at the O.J. Simpson robbery/kidnapping trial, however, he was booked into the Clark County Detention Center. One of the two men who brought guns last year to a Las Vegas hotel to get O.J. Simpson memorabilia from two dealers said on the witness stand that Simpson told the two men to bring "heat" to the confrontation. O.J. Simpson’s lawyer, Yale Galanter, has moved for a mistrial. O.J. Simpson told one of his companions to "put the guns away," when Simpson and his entourage had a run-in with two collectibles dealers on Sept. 13, 2007, at a Las Vegas hotel, a witness in Simpson's robbery/kidnapping trial testified Monday afternoon. The first week of O.J. Simpson's robbery/kidnapping trial started fast and closed strong, squeezing opening statements, 10 witnesses, several voice recordings and a field trip to the scene of the alleged crime into just five days. After long week of hearing from analysts, Metro Police detectives and hotel security personnel, the jury of the O.J. Simpson robbery/kidnapping trial on Friday finally heard an audio account of the alleged robbery at Palace Station. Jurors this morning were taken on a secret field trip to Palace Station where they were given a firsthand look at the room where the confrontation between O.J. Simpson and two sports memorabilia dealers took place last year. The colorful collectibles dealer at the center of O.J. Simpson's robbery/kidnapping case was called to testify at the former football star's criminal trial Thursday. One of the first police officers to respond to the alleged sports memorabilia robbery last year in a Las Vegas hotel took the stand Wednesday afternoon in the third day of O.J. Simpson's high-profile jury trial. The jury in O.J. Simpson’s robbery/kidnapping trial heard more details Wednesday about the audio recordings at the center of the case. Defense attorneys continued to try to pick apart memorabilia dealer Bruce Fromong’s testimony and previous statements Tuesday as O.J. Simpson's kidnapping/robbery trial entered its second day. While defense attorney Yale Galanter assured jurors there would be little he-said, she-said during the trial of former golfing buddies O.J. Simpson and Clarence “C.J.” Stewart, three very different opening statements were heard this morning. It was one year ago today that O.J. Simpson was arrested and this morning the former football star will reluctantly mark that anniversary from the defendant’s seat as his criminal trial gets under way. No cake, no candles and no champagne marked this occasion: the anniversary of the day O.J. Simpson and four others allegedly raided a hotel room was observed quietly at the Palace Station Hotel & Casino. It has been exactly 365 days since O.J. Simpson and five other men supposedly raided a Palace Station hotel room and stole various items from two memorabilia dealers. O.J. Simpson’s future and freedom is in the hands of a predominantly white, predominantly female 12-member jury. O.J. Simpson’s defense attorneys clashed with Judge Jackie Glass Thursday as the judge refused to dismiss a prospective juror who admitted he made intentionally opinionated statements about Simpson last month on a sworn affidavit. Wednesday was a productive day in Clark County District Judge Jackie Glass’ courtroom, as 15 people were added to the pool of qualified potential jurors for O.J. Simpson’s upcoming criminal trial. After two days of questioning, Judge Jackie Glass has 12 prospective jurors selected for O.J. Simpson’s upcoming criminal trial. O.J. Simpson looked calm and collected today as he began his first day of court proceedings nearly a year after he walked into a casino hotel room intent on reclaiming some sports memorabilia. The Associated Press · Sept. 8, 2008 · 6:54 a.m. The Nevada Highway Patrol says O.J. 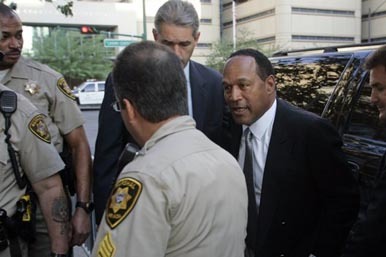 Simpson was stopped while driving, questioned and let go on his way to Las Vegas. By Brian Eckhouse · Sept. 8, 2008 · 2 a.m.
Michael Sommermeyer is one of the Las Vegas Valley’s better-known public information officers — both locally and nationally. That’s due, in part, to the celebrity of Vegas crime. By Brian Eckhouse · Aug. 29, 2008 · 1:32 p.m.
CARSON CITY -- In a 2-1 decision, the Nevada Supreme Court has denied the petition of Clarence J. Stewart to sever his trial for armed robbery and kidnapping from football great O.J. Simpson in Las Vegas. • Follow us on Twitter at "simpsontrial" to get all of the latest developments.